This post is sponsored by Woodbridge by Robert Mondavi Wines. Please enjoy wine responsibly. 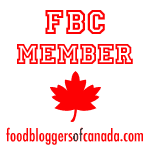 Thanks for supporting the brands that keep the Crumb test kitchen up and running! Ah, the holidays… that mad scramble at the end of the year when the calendar starts to look a little bit like the last round of a game of Jenga. 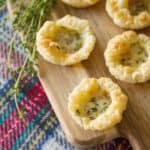 It’s this time of year when I’m most grateful for my trusty arsenal of easy-yet-impressive appetizers for the inevitable last-minute guests, work potlucks and assorted get-togethers with friends. Baked brie is pretty much at the top of my list of party favourites. It’s crazy delicious, and yet so ridiculously easy to make that it almost feels like cheating. Sometimes it’s as simple as popping a small wheel of brie into the oven until it’s deliciously gooey, but it’s twice as nice when it’s paired with a fancy topping. I’ve tried a few different options, like chopped walnuts and honey, sauteed apples, and a spiced fig compote. Out of all the toppings I’ve tried, this particular combo of juicy pears poached in red wine and warm mulling spices might just be my new favourite. My wine of choice? Woodbridge by Robert Mondavi Cabernet Sauvignon. Like the rest of the Woodbridge by Robert Mondavi line-up, it has a fruit-forward balanced flavour and smooth finish, which makes it a great everyday wine. 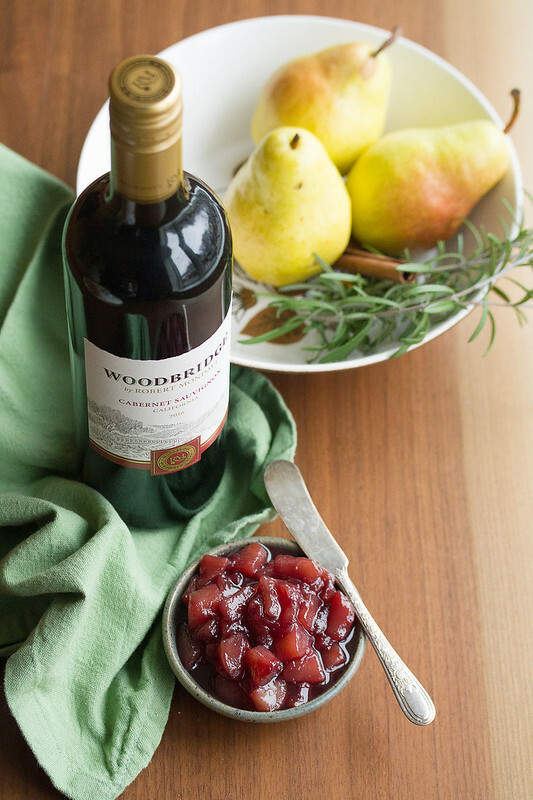 It’s also a great choice in this compote, where its notes of cherry and berry complement the sweetness of the pears and the warmth of the spices, and its brilliant colour reduces down to a glossy garnet syrup. Granted, the compote does take about 45 minutes to cook up, so it’s not exactly an instant dish… but the good news is that it can be made a couple of days beforehand if you don’t have time on the day of. Plus it makes your house smell like Christmas for the rest of the day, which is pretty handy if you need a little aromatherapy inspiration to get you into the holiday spirit. 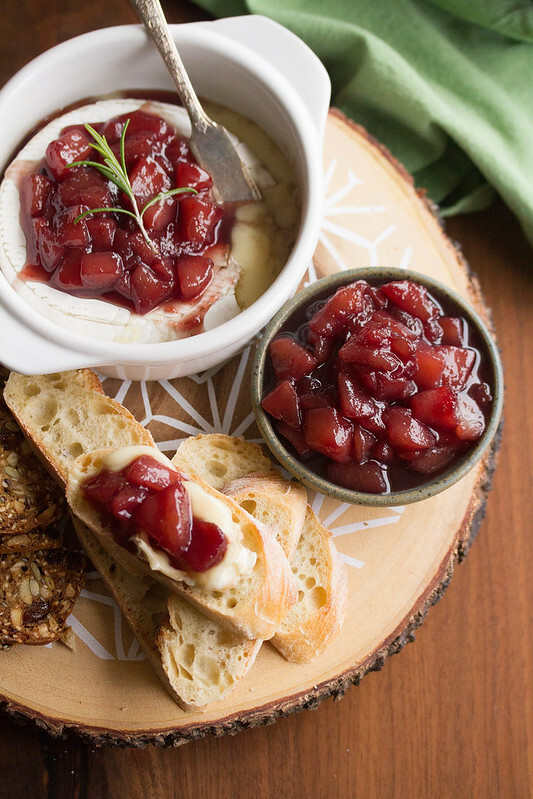 And best of all, this recipe only uses up a half-cup of wine, which leaves you with plenty of left over in the bottle to sip as you devour your gooey freshly-baked brie. Look for Woodbridge by Robert Mondavi Classic wines in the California section of your local liquor store. For more recipes, serving tips, and a neat wine pairing app that’ll help you choose the perfect wine for your food, visit the Woodbridge by Robert Mondavi Wines website. Gooey baked brie gets dressed up for the holidays, thanks to a quick topping of pears poached in red wine and mulling spices. 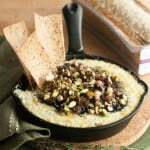 In a small saucepan set over medium-high heat, combine the wine, honey, orange zest, cinnamon stick, cloves and star anise. Bring the mixture to a simmer. Stir in the pears, and reduce the heat to medium-low. Simmer, uncovered, for about 45-50 minutes, or until the pears are very soft and most of the liquid has evaporated, stirring frequently. Remove from heat, and discard the orange zest and spices. 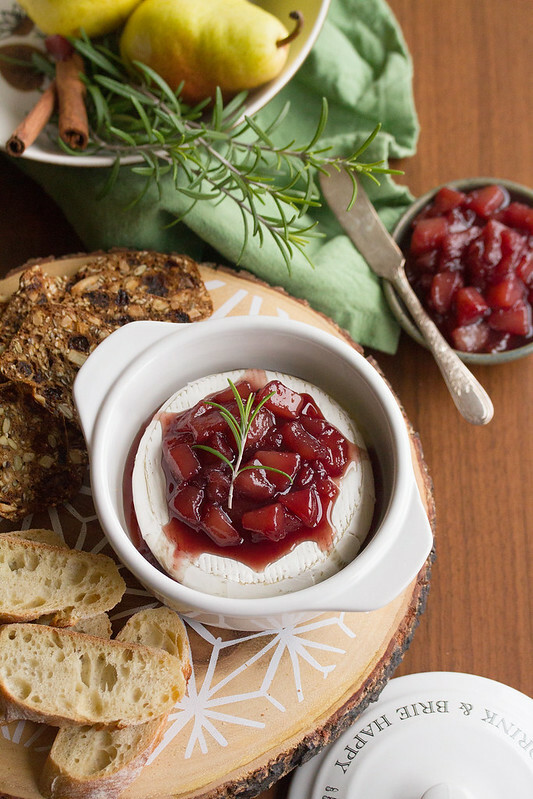 Set aside to cool while you bake the brie. Preheat the oven to 400°. Place the brie in a small baking dish. 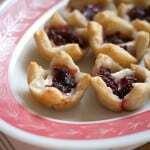 Bake for 8-10 minutes, or until the centre is soft and gooey. Spoon some of the pear compote over the baked brie. 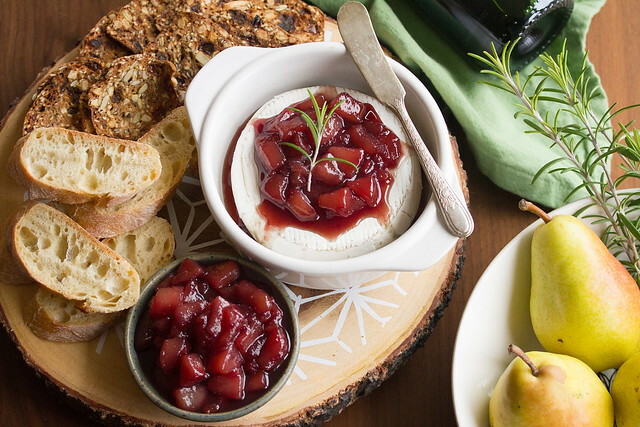 Serve immediately with thin slices of baguette or your favourite crackers for dunking, along with the remaining compote in a pretty dish. Another delicious recipe Isabelle. Can’t wait to try this next time I’m serving Brie. It will be such a great combo! Wine-poached pears are one of my favourite desserts, and now you’ve added luscious gooey Brie too! Brilliant! 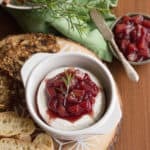 I love baked Brie, of course, but this wine infused compote takes it over the top! I can just imagine how amazing it smells while making it. 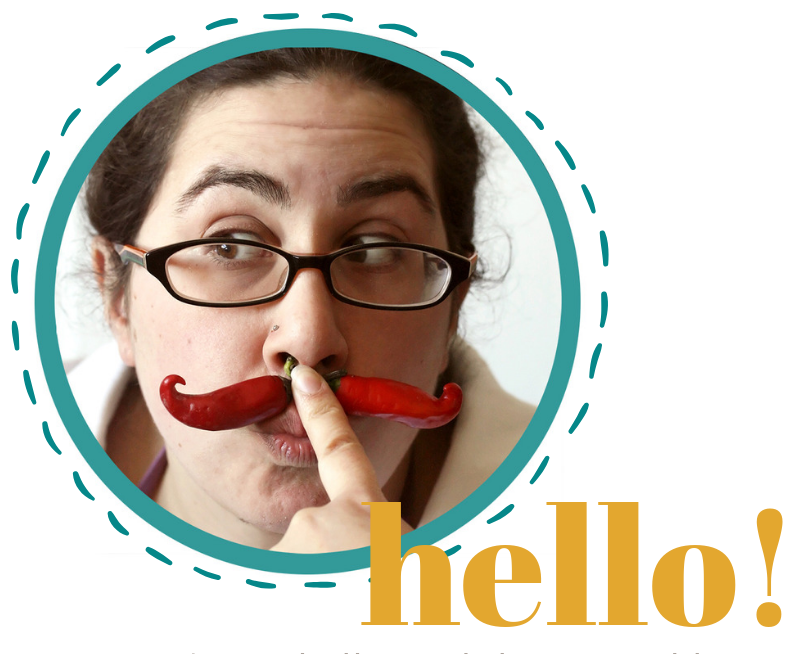 This looks like a delicious holiday appetizer, Isabelle. I love the flavour combinations paired with the wine you featured. I am looking forward to trying it. holy macaroni that looks good! 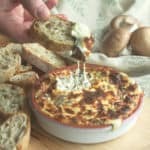 I’m a sucker for gooey cheese (aren’t we all?!) but wine too?